Over 10,900 acres (4,400 hectares) of Yungas forest is now under the ownership of World Land Trust’s (WLT) partner Fundación Biodiversidad Argentina (FBA) after its President Obdulio Menghi signed an agreement with its former owner on May 12. 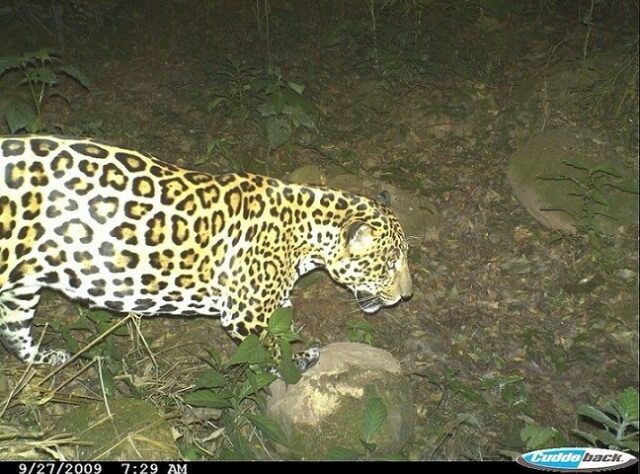 Fundraising to create the new El Pantanoso reserve has been a priority since the property became available and was one of the projects to benefit from WLT’s Big Cat Appeal of 2014, as Yungas forest is the largest continuous habitat left for Jaguars in Argentina. This purchase secures a corridor between the Calilegua National Park and the Estancia Urundel for a host of wildlife including more than 350 bird species, around 120 mammal species, 123 tree species and 144 butterfly species. A recent survey to the site recorded tracks of Lowland Tapir (Tapirus terrestris), Jaguar (Panthera onca), Crab-eating Racoon (Procyon cancrivorus), Puma (Puma concolor), Capybara (Hydrochoerus hydrochaeris) and Neotropical otter (Lontra longicaudis). The survey assessed the condition of the buildings within the site that FBA has inherited, as the reserve includes river valleys from the Morado and Pantanoso rivers and has recently had problems with floods damaging the buildings on the site. This assessment is key in going forward with the next stages of managing El Pantanoso, which include possible collaboration with neighbouring landowners, investigating eco-tourism and volunteering opportunities, and establishing an environmental education programme with children from the local school in El Bananal. The Yungas forest contains several ecosystems due to the huge variation in altitude (400 metres to around 3,000 metres above sea level) and climate, and it is likely that further research in the area will uncover new species. This purchase has ensured that an important area of land is protected from logging, oil exploration and land-clearing for agriculture, which has already claimed more than 90 per cent of the basal rainforests in Argentina. However, WLT still needs your support to raise the funding for ongoing land purchase payments and initial management and protection. To help secure further land purchase, you can donate to Buy an Acre in Argentina.